Welcome to the Chronicles of Elyria update for the week of August 8th, 2016! This week's update will be on the lighter side, as most of the work the team is doing right now is still in-progress. That said, the stuff the design team has been working on does tie in nicely to a render/screenshot I've been holding onto. So, I'll use this week's update to share that and talk about it a bit. Also, last week's update, Down the rabbit hole..., was one of the more contentious updates, with people coming down on either side of a debate regarding whether they liked the new changes or not. This lead to an (as of now) 11-page forum topic about the subject. Ultimately, most of the peoples' concerns were based on some false assumptions, and once those were clarified, most people seemed to be satisfied. If you're like others and had some concerns about last week's update, you might check out my post in the thread I don't like this change... and see if it doesn't calm your nerves. Ok, with that out of the way, let's get to the roll call! There's no question. Production is focused first and foremost on the hiring process right now. We're still seeing great resumes/CVs come through LinkedIn and Gamasutra, and I'm currently setting up phone calls and live interviews with over 50 people in the next couple weeks. Aside from that, the Web Team has cleared out most of the main bugs that would prevent us from shipping a new private message system and online store to you. No date available yet, but as soon as we've got a date, we'll let you know. The character artists continue to work on the female models, adding support for aging in addition to the body dynamics we showed last week. The character artists have also been fleshing out our art pipeline with respect to clothing and armor. We're using a few different tools to create the assets, and rather than focus on pumping out assets straight away, we're spending the time making sure we have a sustainable workflow using those tools. Early on in the project, we decided we really wanted a feeling of being planted in the world. That is, we wanted it to feel like you were really there. As a result, we had a very robust animation system that blended between even seemingly minute variations in animations to account for all the transitions we make in our world. For example, when we're running and come to a stop, we don't do it immediately. We generally slow down to a bit of a trot, then a walk - even for just a step, and then come to a complete stop. Our early animation state machine worked much the same way. It looked and felt like you were really there. Unfortunately, it didn't feel responsive. You'd be running, let go of the forward button, and then take several steps before slowing down enough to come to a complete stop. As a result, we've been progressively making trade-offs between realism and responsiveness, in an effort to get the right feel. So this week one of our animators has been working on modifications to the run and sprint animations, to coincide better with the more responsive locomotion system our client engineer has been working on. Fortunately, it feels like we've finally found the right mix. When walking, the system is extremely responsive, even allowing you to tightrope walk if you wanted to. This is very important for some of the platformer-like elements we're planning to integrate into the game. When running, your character is allowed to take one step when attempting to come to a stop. That's enough that the animation seems natural, but not so much you can't anticipate where it will stop. When sprinting, your character takes about three steps to come to a stop. This is necessary so it doesn't look like your character is throwing all their weight forward, while still making it look and feel like a real, living world, rather than an avatar that is just changing animations on command. Ultimately, we think you guys will like where we're at. The environment team continues to add detail and richness to Titan's Steppe. For those that are just tuning in, Titan's Steppe is an area that exists on all servers of the game and is the setting for the Prologue: The Awakening. Within Titan's Steppe are the town of New Haven and the village of Silver Run. What do you think? Does showing off Silver Run and New Haven seem like a good way for us to show off the new walk, run, sprint system? Yeah. We think so too. Stay tuned for video footage. No release date yet, but as usual, once the video is ready to release, we'll let you know. Speaking of Titan's Steppe. This is the perfect transition into what the design team has been working on this week. When we initially designed the world, we identified 18 biomes which ranged in humidity, temperature (based on latitude), and elevation. Those have worked great from a conceptual standpoint, but now we're going back over the 18 biomes and deciding whether there's enough uniqueness between them to justify all 18, or whether we should collapse some down and reduce the number of biomes. At the same time, each biome brings with it a natural set of adaptations. One of our designers has been doing significant research on the adaptations of plants and animals within the different biomes of our world and translating those over into adaptations in Elyria. From this, we're coming up with some very interesting flora and fauna. We'd love to show you all of those. However, they're still just in a conceptual state right now. To ensure a consistent food chain throughout Elyria, the designers are starting from the lowest level of the food chain - lichen, moss, fungi, etc... and are working their way up. As we get further up, we'll develop new concept art which identifies those creatures unique to Elyria. We're pretty sure you're going to dig them. To finish off this week's update I wanted to talk a bit more about how the world is built. I've talked about this on the forums before, but I don't believe it's made it into an update yet. 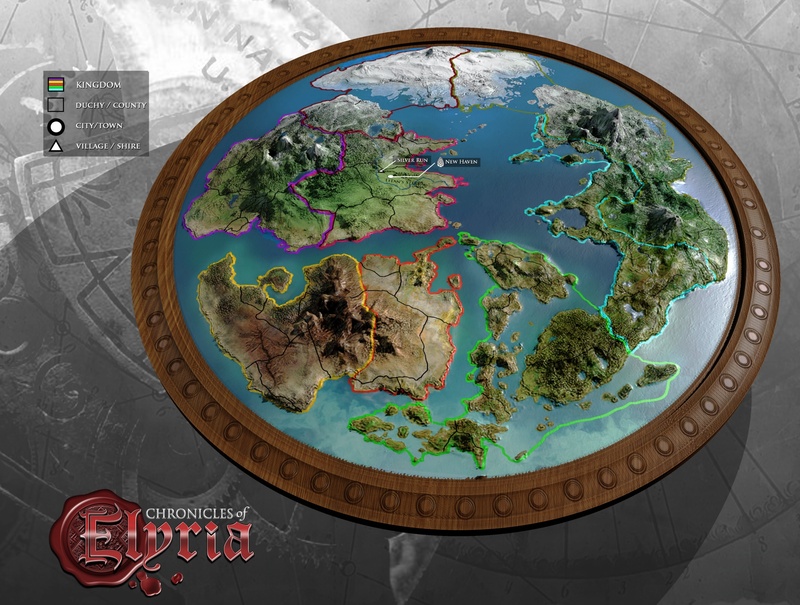 The different servers/worlds in Chronicles of Elyria are each procedurally generated, and each goes through a multi-step process during creation. First, we take the largest map size we want and break it up into tectonic plates. From there, we erode the plates, translating and rotating them and letting them collide with one another, forming convergent boundaries that form subduction zones, mountains, and volcanoes. Once this is done, we have a basic outline of the continents and mountains. From there, we run height map generation algorithms on the continents in order to create a natural, realistic feeling terrain. Next, we take large circles and overlay them on the map, each identifying major wind patterns which effect the pressure systems near and over the continents. When combined with the latitude/temperature, it allows us to create a humidity map, which is then used to determine the relative humidity in different regions. From there, we take the topology of the map and the humidity, and we establish rivers, lakes, and rain shadows, as well as set the boundaries of the different watersheds / drainage divides. Next, we take the locations of rivers and lakes, the distance from the subduction zones and mountains, and the elevation, and we use that to distribute soil types and to procedurally distribute metals and other natural resources across the map. Now we have our biomes. The temperature is determined largely by latitude and elevation, and the humidity is set by the air pressure and the presence of rain shadows - areas to the east of large mountains where rain doesn't fall. From here, we can populate the biome with flora, fauna, and people. With the knowledge of where trees, food, and water are, as well as the boundaries of the mountains, watersheds, rivers, etc. we can identify what the boundaries of the different domains will be. Kingdoms are generally divided by large topographic structures, such as mountains, large rivers, or biome changes. Duchies are almost always divided by biome changes. And finally, counties are generally separated by drainage divides, smaller rivers, or forests. In the end, you get something like the following map. Please note, this map shows the biomes of the sample world we're working with. It also shows the borders of Kingdoms (in color) as well as Duchies (in black). It should be noted that this isn't necessarily the complete world, and isn't the world at the beginning. This map shows the kingdom boundaries after expansion has occurred and travel overseas to neighboring continents. Even still, it serves as a good example of the world you can expect to enter in Chronicles of Elyria. And look...you can see where Titan's Steppe is on our test map. The environments, biomes, and regions are all undergoing final design. Once we complete this step of the process, we'll be able to communicate a lot more about the world you'll be entering during exposition. With settlements placed near natural resources, animals breeding in the wild, and creatures that inhabit the less frequented areas of the world, Elyria should prove more than enough to explore. Very cool, looking forward to the biomes and how territories differ. A little late but thanks for keeping us fans updated! Just joined the community recently and CoE seems like a really interesting concept. This game has so much potential and these improvements are making it look like a real, true MMORPG. A little late but thanks for keeping us fans updated! Just joined the community recently and CoE seems like a really interesting concept. This game has so much potential and these improvements are making it look like a real, true MMORPG. This game seems awesome! Great post! Thanks! thanks for providing us with the latest info!! Thanks for telling us from where we can find metals. But have you ever tried to convert these metals. Just convert these metals through nbm metals. You 'll get someone thing. The detail and effort to make a map like these are going to be is truly incredible. Wow this is amazing. The detail and effort to make a map like these are going to be is truly incredible. I can't wait! I think its awesome that they create the world like this. Procedural generation is awesome! I think its going to be quite interesting that each server's map will be different! I might have to get several sparks of life to try out different places lol! just love the thought that goes into the environment. utilizes geology to create an world which weather and environment is created based on how it would occur in real world. opposed to simply making here a rain area and this a tundra which is what most games actually do. this game is truly revolutionary. It is neat that they create a world in this way. Most games just have blocks of land that do not make any geographic sense! Posted By **Ultimatrix** at 2:30 PM - Sun Aug 28 2016 > > Awesome. It is neat that they create a world in this way. Most games just have blocks of land that do not make any geographic sense! First, glad to hear that y'all are working on the store, I was beginning to wonder... Second, The animation looks cool af. This game looks like it has so much potential. Sitting on the edge of my seat every time more news comes out. Really looking forward to this game. I happened to stumble upon it this week, and wow. Very impressed! Keep up the good work! @Crosshair SpatialOS is there answer. It can track millions of entities. Link You should definitely go to the improbable website and read up on it. Posted By **Crosshair** at 4:21 PM - Thu Aug 18 2016 > > First, > Immersion, you spoke of making the game natural looking but I think that the oculus line will be a game changer. > Second, > How do you possibly think that even a gamer October (which most don't have) or a server can take the burden of processing so much info, a game like yours mostly hasn't been developed because servers can't process that much. I love your dream but you'd better have 20 of the most powerful supercomputers in the world in your basement @Crosshair SpatialOS is there answer. It can track millions of entities. [Link](https://chroniclesofelyria.com/blog/7623/Soulbound-Studios-Partners-with-Improbable) You should definitely go to the improbable website and read up on it. The starting continent is predicted to be 256 km by 128 km. However, they will have other continents within the game as well. Main cities and capitals are to be expected as time goes on and players flock together and kingdoms begin to sprout up. Love how realistic the world creation system is! It should produce far more real-seeming results than the standard "draw a vaguely continent-shaped blob and add mountain ridges" that so many games seem to use. With the tectonic plates, will you have mid-ocean ridges? What about triple junction breaking points so we can have pointy spots like Somalia on Earth? I'm assuming with the mention of volcanoes and subduction zones in the same sentence there'll be subduction-zone triggered volcanoes like the Cascades or Indonesia, but will there also be hotspot volcanoes like Hawaii or Iceland? What about large igneous provinces like you find in the scablands of eastern Washington or, oh, most of Siberia? When you're running the simulation, will there be super-continent phases? Earth's had about seven of them over it's life span. They're useful for figuring out where older mountain chains like the Appalachians are formed. And will tectonic plates be subsumed under other plates, like the Farallon plate whose disappearance formed the Rockies from a succession of archipelagoes slamming against the mainland? And will we be getting rock layers forming from the process, such as coal from ancient swamplands, sandstone from deserts, chalk from life-rich shallow seas? Though that might be too complex to keep track of for something like this. Still, it would create very realistic strata, so a rock-obsessed girl can hope! Love how realistic the world creation system is! It should produce far more real-seeming results than the standard "draw a vaguely continent-shaped blob and add mountain ridges" that so many games seem to use. With the tectonic plates, will you have mid-ocean ridges? What about triple junction breaking points so we can have pointy spots like Somalia on Earth? I'm assuming with the mention of volcanoes and subduction zones in the same sentence there'll be subduction-zone triggered volcanoes like the Cascades or Indonesia, but will there also be hotspot volcanoes like Hawaii or Iceland? What about large igneous provinces like you find in the scablands of eastern Washington or, oh, most of Siberia? When you're running the simulation, will there be super-continent phases? Earth's had about seven of them over it's life span. They're useful for figuring out where older mountain chains like the Appalachians are formed. And will tectonic plates be subsumed under other plates, like the Farallon plate whose disappearance formed the Rockies from a succession of archipelagoes slamming against the mainland? And will we be getting rock layers forming from the process, such as coal from ancient swamplands, sandstone from deserts, chalk from life-rich shallow seas? Though that might be too complex to keep track of for something like this. Still, it would create very realistic strata, so a rock-obsessed girl can hope! Teleportation? Instance? Perhaps? Who Knows? I do not yet know the system mechanic of Jail Time. Will NPCs actually hold you and walk you to the local prison even though it may be two towns over? And what about leaving prison? Will they actually walk you to the front door or will you just 'pop' back at your home or town? And since there are no instances in the game I do not understand how Jail will work on a general level. I gues time will tell, along with a few more Dev Journals. Teleportation? Instance? Perhaps? Who Knows? I do not yet know the system mechanic of Jail Time. Will NPCs actually hold you and walk you to the local prison even though it may be two towns over? And what about leaving prison? Will they actually walk you to the front door or will you just 'pop' back at your home or town? And since there are no instances in the game I do not understand how Jail will work on a general level. I gues time will tell, along with a few more Dev Journals. When are you making more dev. Journals? I believe from what I remember caspian saying about jail, he doesn't want to take play time away at that moment but jail would incur a serious spirit penalty, more than a normal coup de grace would normal penalize you. Jails would actually be a different game experience. Posted By **Antelino** at 10:21 PM - Wed Aug 17 2016 > > I believe from what I remember caspian saying about jail, he doesn't want to take play time away at that moment but jail would incur a serious spirit penalty, more than a normal coup de grace would normal penalize you. Jails would actually be a different game experience. I believe Tenji was referencing this post. Side thought - Maybe with technology advancements people are able to create faster ships, planes, or wagons. OR Even magical advancements allow teleportation??? Which could potentially be an interesting mechanic. Even a 'scientific' method of teleportation would be awesome depending on the costs involved and reagents needed to teleport. I believe Tenji was referencing this post. Posted By **B0jangles** at 7:05 AM - Mon Aug 15 2016 > > > Side thought - Maybe with technology advancements people are able to create faster ships, planes, or wagons. > > OR Even magical advancements allow teleportation??? > Which could potentially be an interesting mechanic. Even a 'scientific' method of teleportation would be awesome depending on the costs involved and reagents needed to teleport. Ah, OK. But, with magic being /ULTRA/ rare, it is best not to even consider magic as an option. And, as for science, if you can give me definitive proof that it can happen, I might think it is an option. Even the Philadelphia experiment was a failure. Posted By **Zhinj** at 7:30 AM - Tue Aug 16 2016 > > I believe Tenji was referencing this post. > > Posted By **B0jangles** at 7:05 AM - Mon Aug 15 2016 > > > > > > > Side thought - Maybe with technology advancements people are able to create faster ships, planes, or wagons. > > > > OR Even magical advancements allow teleportation??? > > > > Which could potentially be an interesting mechanic. Even a 'scientific' method of teleportation would be awesome depending on the costs involved and reagents needed to teleport. Ah, OK. But, with magic being /ULTRA/ rare, it is best not to even consider magic as an option. And, as for science, if you can give me definitive proof that it can happen, I might think it is an option. Even the Philadelphia experiment was a failure. This game look amazing!! cant wait. I really liked this part about the maps and it made me think about the cartography skill. It amuses me when I realized that there's eventually going to be some kind of cartographer's guild that'll publish an online map of the entire world for each server. Rather than everyone relying on one guild on one server's maps to guide them. Now they can actually see and perhaps hinder or help the cartographers of their server. Since the world will change and the maps might become slightly outdated, it will require updates of the maps from time to time. So many guilds would probably fight over that they have the "right map". On a side note, wonder if you can add resources, iron deposits and such in the future. Those maps would be worth abit for the industrial player. Shut up and take more of my money! I really like the part about the animations. Would be great, when you establish horse-animations on the level of Red Dead Redemption or Witcher 3, where the horse is turning in the moving-direction and behaving very dynamic. So... is Elyria flat or round? Posted By **Talmanes** at 6:24 PM - Mon Aug 15 2016 > > So... is Elyria flat or round? Cubed of course. Really impress by the work you have done so far. Responsiveness vs realistic animation is an important debate. I believe much more testing will be needed to be done before you can chose what exactly is the best. We would want to fall off a cliff because we couldn't turn right on time. Last I heard they had 3 steps stop for max speed running. So it wont be all realistic but as close as can be without effecting gameplay too much. That map generation strategy sounds amazing! The fact that you've gone to the effort to set a simulation for the map generator is astounding. Looking forward even more to seeing how the worlds turn out now. A quick question regarding running and dexterity, based on what has been mentioned in the update: Will pivot-turns and the like be possible during running/sprinting animations, or restricted to slower movement? If it requires a step or more to come to a stop, I'm curious to know if more dextrous folk will be able to do things normal people can't in how they move. That map generation strategy sounds amazing! The fact that you've gone to the effort to set a simulation for the map generator is astounding. Looking forward even more to seeing how the worlds turn out now. A quick question regarding running and dexterity, based on what has been mentioned in the update: Will pivot-turns and the like be possible during running/sprinting animations, or restricted to slower movement? If it requires a step or more to come to a stop, I'm curious to know if more dextrous folk will be able to do things normal people can't in how they move. Cannot wait to explore this amazing world!! For the stopping animations, down the line will the animations be the same for all or will it take account for your agi rating, current weight carrying, and the type of surface you are stopping on. The thought that's gone into the world creation - just...wow. Amazing. Yes! I would love to see this. I remember first seeing Video game dev videos for "The Battle for Middle Earth" and just being absolutely blown away by the process required to make a game. The process that is being used for creating the world is incredibly interesting and well thought out. The creation process speaks to an extremely vast world with many different continents and various geographical boundaries. My only concern is how much of the world a single person is going to be able to explore. I see a couple options: - a character can travel relatively quickly and seeing the entire world is easy. - a character will never see the whole world in a lifetime and it would take multiple lifetimes to see it all. - a character can see the world but would have to dedicate their entire life to doing so. Now, I know this simplifies the situation a bit but I'm sure you all can see what I'm getting at. Both ends of the scale have benefits for player satisfaction but it looks like the development is leaning towards a character never seeing the entire world. What are the community's thoughts towards that? The potential lifecycle of the world once it's up and running leaves so much to be imagined and I think that is a part of why we are all so hyped for it. The process that is being used for creating the world is incredibly interesting and well thought out. The creation process speaks to an extremely vast world with many different continents and various geographical boundaries. My only concern is how much of the world a single person is going to be able to explore. I see a couple options: - a character can travel relatively quickly and seeing the entire world is easy. - a character will never see the whole world in a lifetime and it would take multiple lifetimes to see it all. - a character can see the world but would have to dedicate their entire life to doing so. Now, I know this simplifies the situation a bit but I'm sure you all can see what I'm getting at. Both ends of the scale have benefits for player satisfaction but it looks like the development is leaning towards a character never seeing the entire world. What are the community's thoughts towards that? Side thought - Maybe with technology advancements people are able to create faster ships, planes, or wagons. OR Even magical advancements allow teleportation??? The potential lifecycle of the world once it's up and running leaves so much to be imagined and I think that is a part of why we are all so hyped for it. I think that teleportation is taking away the realism that CoE want's to give it's players, especially regarding the playstyle as a merchant where the distance you travel between different biomes will greatly increase your profit, obiously because of the supply and demand, and resources available that differ in different regions. Additionally i wish for a world big enough or at least complex enough, that the possibility exists to find locations that for example none of your friends have visited yet. Um, wrong game. There won't be any teleportation or fast travel in CoE. You have to walk/ride everywhere. Besides, if there was teleportation, it would put the caravan robbers and highwaymen out of business. Besides, I have heard a rumor (OK, saw the video on YouTube) that said that Caspian was looking to play a Robin Hood type character. How is he gonna do that if there is teleportation? He won't be able to say 'Stand and delivery'. Posted By **Tenji** at 4:50 AM - Tue Aug 16 2016 > > I think that teleportation is taking away the realism that CoE want's to give it's players, especially regarding the playstyle as a merchant where the distance you travel between different biomes will greatly increase your profit, obiously because of the supply and demand, and resources available that differ in different regions. Additionally i wish for a world big enough or at least complex enough, that the possibility exists to find locations that for example none of your friends have visited yet. Um, wrong game. There won't be any teleportation or fast travel in CoE. You have to walk/ride everywhere. Besides, if there was teleportation, it would put the caravan robbers and highwaymen out of business. Besides, I have heard a rumor (OK, saw the video on YouTube) that said that Caspian was looking to play a Robin Hood type character. How is he gonna do that if there is teleportation? He won't be able to say 'Stand and delivery'. Posted By **Tenji** at 10:50 AM - Tue Aug 16 2016 > > I think that teleportation is taking away the realism that CoE want's to give it's players, especially regarding the playstyle as a merchant where the distance you travel between different biomes will greatly increase your profit, obiously because of the supply and demand, and resources available that differ in different regions. Additionally i wish for a world big enough or at least complex enough, that the possibility exists to find locations that for example none of your friends have visited yet. Teleportation? I honestly do not see any good coming of making it easy to see all of the world. not everyone wants to see the whole world either, and for those who do, making it so large its almost impossible, means they will never run out of interesting content. i plan on being an explorer of sorts for that reason alone i want the world as large as possible. I honestly do not see any good coming of making it easy to see all of the world. not everyone wants to see the whole world either, and for those who do, making it so large its almost impossible, means they will never run out of interesting content. i plan on being an explorer of sorts for that reason alone i want the world as large as possible. Doubt they add teleportation, and if they did it would most likely only be available to very few wizards personal travels. The ecological understanding that you're putting into this world has me as a behavioral ecologist thrilled. There is so much that is typically forced in game biomes that doesn't make sense. I am so happy that your group is taking a holistic approach to the development of an actual world. THIS right here. As a geo student I am pretty much giddy as F about this. Really enjoyed this update, thanks! Thank you for the info! I think you guys should wait to release the store still November or December. Most people would probably spend twice the amount they currently want to spend (with more pay checks, presents, etc.) and you could release KoE and ElyriaMUD with the store. If you show off a peice of KoE and ElyriaMUD, more people would probably be inclined to upgrade to play the pre-aplha. Seeing that map is inspiring, even if its just a sample map being worked on -- many ideas spring forth from looking at it. I think 18 biomes is a bit excessive. They could probably narrow it down to the 9 major biomes and be good. Seeing that map is inspiring, even if its just a sample map being worked on -- many ideas spring forth from looking at it. I think 18 biomes is a bit excessive. They could probably narrow it down to the [9 major biomes](https://en.wikipedia.org/wiki/Biome#Walter_system) and be good. Honestly I think 18 booms would be great. considering the different building materials the building designs or even just stuff for home decorating. So, how will it be determined where Titan's Steppe lies in the world? Will it be a part of a kingdom? Could a player noble take it as their duchy during exposition? Could they then rename it? In one of the QnA sessions he answers that the world is procedural but with some 'crafted' areas seeded into the world. Important locations, interesting designs (IE: waterfalls, lakes, structures etc.) some might repeat, some might not appear on a server at all. I imagine Titan's Steppe will be painted into world after generation in the most applicable populated location as it's a large area and not just some small feature design. I am guessing that a place as important as New Haven and Titan's Steppe will not be procedurally placed. It's going to need to be one of those 'crafted' areas. My question was more along the lines of where it exists politically. Let's say, during exposition, a monarch decides to claim the kingdom in which Titan's Steppe lies. She chooses the Titan's Steppe Duchy as her royal duchy, and decides to make her seat in New Haven. By all rights, according to backer rewards, that monarch could rename Titan's Steppe and New Haven instantly. Will that be possible? Or will Titan's Steppe be a protected area, unable to be influenced by exposition meddling? I am guessing that a place as important as New Haven and Titan's Steppe will not be procedurally placed. It's going to need to be one of those 'crafted' areas. My question was more along the lines of where it exists politically. Let's say, during exposition, a monarch decides to claim the kingdom in which Titan's Steppe lies. She chooses the Titan's Steppe Duchy as her royal duchy, and decides to make her seat in New Haven. By all rights, according to backer rewards, that monarch could rename Titan's Steppe and New Haven instantly. Will that be possible? Or will Titan's Steppe be a protected area, unable to be influenced by exposition meddling? I would imagine those kinds of things would not be able to be renamed with the kickstarter rewards, and I would be willing to bet that the people who backed enough to claim those first would never rename them. Interesting Update! Looking forward for the videos! Love the update, your way of making the world is amazing and I cannot wait to run around in it. Can't wait for the next update!